Williams Baptist University in Walnut Ridge has announced that, starting next fall, all full time, on-campus students will be provided iPads. School officials say the iPads will become an integral part of the learning process at WBU. As a first step in the initiative, the liberal arts university supplied iPads to faculty, coaches and administrators last week. Williams personnel will spend the coming months training on the devices and learning how to incorporate them into their classes. 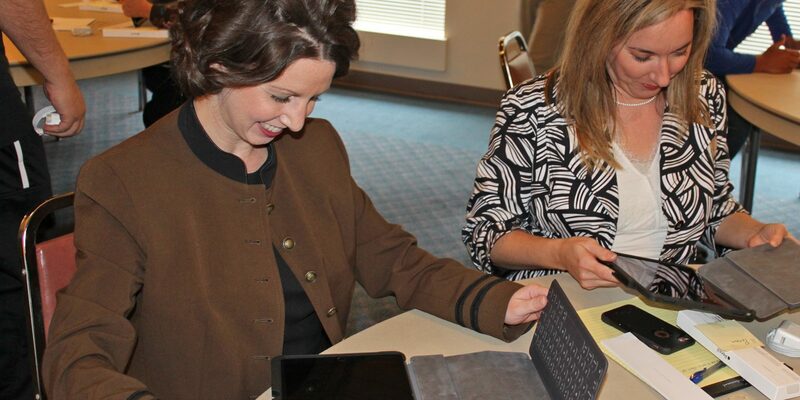 Pictured above, Dr. Amy Schmidt (left) of the WBU English faculty and Heather Parson, chair of the Department of Business, unpack their new iPads. The initiative has been dubbed the WBU Eagle EDGE, which is an acronym for Empowering Digital Global Education. “With our Eagle EDGE initiative, WBU is embracing the technology that is so much a part of our lives today. This is the way today’s college students communicate and gather information. We are harnessing these innovations and incorporating them into a cutting edge university education,” said Dr. Stan Norman, president of WBU. All on-campus students at Williams will receive iPads when they enroll next fall. The cost of the devices will be covered by their student fees, and after four years the students will be allowed to take their iPads with them as they continue their careers. Students who graduate or otherwise leave WBU sooner than four years will have the option of buying their devices at a significantly reduced cost. WBU has considered the iPad initiative for the past several months. Dr. Brad Baine, vice president for academic affairs, led a mobile learning initiative task force of faculty and staff in studying the proposal. “Our task force has done great work in developing the Eagle EDGE initiative. As we examined the proposal, our team became very excited about the prospect of incorporating this technology into the learning process,” said Baine. Baine said students will use their iPads for a wide array of educational tasks, both inside the classroom and out. The devices will come equipped with educational apps, and electronic books and articles will be available to them.